“An itsy bitsy spider, crawled up the water spout…”, or so the popular nursery rhyme goes. If you hate these 8-legged creatures due to the webs that they leave behind, perhaps you might want to think twice before smashing them to bits and pieces with a fly swatter – after all, they do help keep the pesky insect population in check. 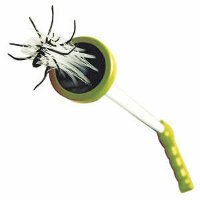 To catch a spider might freak some of you out – so why not get some help from the £9.99 Spider Catcher? This gadget comprises of a long pole alongside a handle and spiny bristles at the end. When you pull the trigger, the bristles will open, and when the trigger is released, the bristles will close – this particular mechanism will enable you to capture any of those spiders around the home, all without causing any harm to them. Once they’re safely captured, you will be able to release them outdoors in a safe manner. It works great for wasps, bees and other stinging insects as well.